Nigerian filmmaker, Jay Franklyn, penultimate Friday premiered his latest production, Dinner, at FilmHouse IMAX Cinemas, Lekki. The star-studded movie features stellar performances from its lead actors, Deyemi Okanlawon, Kehinde Bankole, Enyinna Nwigwe, Keira Hewatch, Okey Uzoeshi, RMD and Ireti Doyle. A movie about love, betrayal and forgiveness, producers say Dinner is currently showing in all cinema outlets nationwide. Dinner is the story of Mike Okafor, who is invited by his childhood friend and buddy; Adetunde George Jnr, to have ‘Dinner’ and spend the weekend with him and his fiancée, Lola Coker, as they plan for their upcoming wedding. Mike decides to come along with his girlfriend ,Diane Bassey, as he plans to propose to her. Things get out of hand when they arrive at Adetunde’s house and find out secrets about each other’s relationship and the one person in the middle of it all. 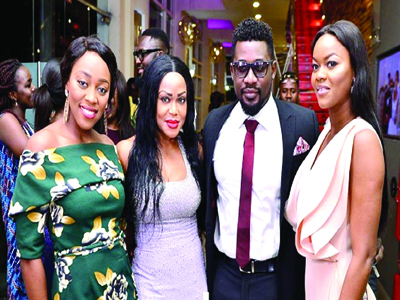 The premiere, which was sponsored by Amstel Malta, was attended by celebrities including Okey Uzoeshi, RMD, Kiki Omeili, Deyemi Okanlawon, Bez, Daniel K Daniel, Kehinde Bankole and a host of others.